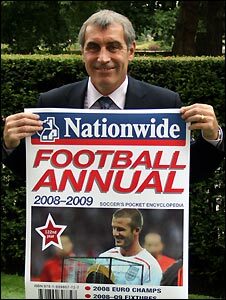 Fans of football statistics will be relieved that their oldest annual has a new lease of life after Nationwide stepped in to rescue the volume. The mutual, which sponsors the England, Scotland, Northern Ireland and Wales football associations, is sponsoring the annual - first published in 1887. The building society stepped in as the book, which has enjoyed decades of sponsorship, was near to closure. It was founded as the Athletic News Football Supplement & Club Directory. Nationwide has agreed to back publication of the book, which is thought to be the second-oldest sporting annual after Wisden, for the forthcoming 2008/09 season. The book was launched by former England goalkeeper Peter Shilton, whose 125 national appearances just outstrip the annual's 122 editions. "We have agreed to back the book for this year," says Chris Hull, head of sponsorship at Nationwide. "We are one of the biggest football sponsors in the country, and felt that in terms of a sponsorship fit it was a good one. "Over the years we think we have built up some credibility with football thanks to our backing of the sport, which started about 12 years ago now." He said the intention of this year's sponsorship was to keep the book afloat after it lost its previous backer, the News of the World. "The publication needed help, and did not have a backer. This is a book that has always had backing," said Mr Hull. "No decision has been made yet on support for next year, but if it is successful this year we would not rule anything out." Both editor Stuart Barnes and publisher Randall Northam of Sportsbooks said they were glad to have the backing of the Nationwide. The annual began 121 years ago with 16 pages, whereas the new edition comes in at a weighty 544 pages. Football anoraks will be delighted at the trove of information from team line-ups to international results; from international appearances and goalscorers to the sort of trivia to keep a pub quiz in questions for half a century. 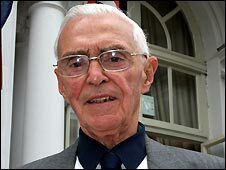 And one of those especially pleased is Albert Sewell, now 81, and the BBC's football statistician from 1968 to 2005. He became known to the public when Des Lynam, during his stint as presenter of Match of the Day, regularly referred to him as "Our man Albert". And Albert, who edited the football annual from 1983 to 1997, said he was "delighted" to see the yearbook continue. "I am glad the annual is continuing as it is such a tradition," he said. "Some people asked me to carry on with my statistics but it is not something you can really do part-time." 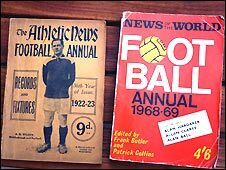 Albert, who has retired from full-time statistics-keeping, has a collection of some of the older editions of the football annual. Among them is the 1922/23 edition, The Athletics News Football Annual, featuring a hobnail-booted player on the cover. It includes advertisements for the wonderfully-named "Ellison's Rush-Preventive Turnstiles", as well as the sinister-named "Knock-Out Football" and the long-gone "Morris's Cigarettes". The annual also includes the following in its stiff-sounding editorial: "Proposals by Arsenal that transfer fees should not exceed £1,650 were defeated." Football has changed beyond recognition on and off the field since those days when the book was edited by "Tity-Rus", but with the Nationwide's backing, one football tradition will continue for at least another year. And, according to Peter Shilton, as he kicked off the launch of the book's 122nd edition, the volume remains "part of football's heritage".